CHOOSE: Vintage 1993/1994/1995/1996 X-Men Action Figures * Combine Shipping! 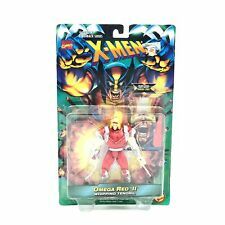 CHOOSE: Vintage 1991-1998 X-Men Action Figures * Combine Shipping! CHOOSE: Vintage 1995-2006 Spider-Man Action Figures * Combine Shipping! The details and fine print. This is for Marvel Legends complete pre-Legends Super Skrull Fire Variant! Coming from a smoke/pet free home, this figure is in excellent condition. Please message with any questions. Cheers! ToyBiz Marvel Legends Apocalypse Build-A-Figure BAF Head/Torso. Piece is from the ToyBiz large BAF and is sold exactly as pictured. Please check photos for condition before bidding. Sold exactly as shown Condition is Used. Shipped with USPS Priority Mail. For sale is a Marvel Legends MODOK Series Iron Man Thor Buster. Vintage 1990's Toybiz Marvel Super Heroes Lot Hulk Jug Magneto Wolverine Daredevil and more as shown Punishers back piece is missing and that is not that Capt's original shield Condition is Used. Shipped with USPS Priority Mail. ToyBiz Spider-Man Action Figure w/Wall Mountable Loft Diorama - Sealed. Condition is New. Shipped with USPS Priority Mail. For sale is a Marvel Legends Series 1 Iron Man. Toybiz X-Men Apocalypse 2nd Edition figure , package does have wear but is still sealed and overall in good condition. There is a large dent in the upper bubble. Toybiz Marvel Legends Galactus Series 1st Appearance Hulk. Brand new, factory sealed. Great item for the Hulk collectors! Mojo is about 85% complete. As you can see in the photos he is MISSING HIS LEFT LEGS BASE. The included parts look to be in good working order. They have very little, if any, storage wear. Just one more part and you'll have a complete Mojo! Lot Of 4! FANTASTIC FOUR - INVISIBLE WOMAN (CLEAR) - ACTION FIGURES. You get all 4! Some of some wear and price tags. Complete on card. Pics May differ from the ones you are getting because I have 3 sets. Or you can buy multiple I have a bunch of cool X-men and fantastic four and Batman. Shipped with USPS Priority Mail. Up for auction is a 12 inch Marvel ToyBiz Venom. He is unbroken, has tight joints and has paint rub/wear on him. This figure would make a great addition to any collection. All pictures on my auctions are of the actual items. I do not use stock photos. If you have any questions, please ask. 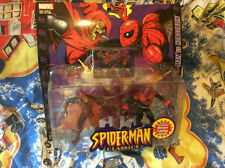 ToyBiz The Amazing Spider-Man Classics Black Spiderman with comic Action Figure. Condition is New. Shipped with USPS Priority Package. Marvel Superheroes Spider-Man. Web-Suction Hands. X-Men SAVAGE LAND Action Figure NEW ToyBiz STORM . Condition is New. Shipped with USPS Priority Mail. Includes two sets of wings: one with the action feature missile launchers intact and another where they have been removed. By Toy Biz. Spider-Man Animated Series. released in 1994. from Series 1. CHOOSE: Vintage 1994-2012 Spider-Man Action Figures * Combine Shipping!